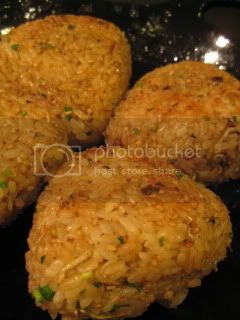 HAPPY DONABE LIFE - Mrs. Donabe's Rustic Japanese Kitchen: Donabe Negi-Jako-Miso Gohan...Yaki Onigiri (Grilled rice balls) on Toban! Donabe Negi-Jako-Miso Gohan...Yaki Onigiri (Grilled rice balls) on Toban! I'm so hooked with my Donabe Negi-Jako-Miso Gohan. The combination of different flavors and textures work quite perfectly in this humble rice dish. So this time, I made it into Yaki Onigiri (grilled rice balls). I made it into triangle-shape onigiri and lightly grilled on Iga-yaki TOBAN (donabe skillet). As the rice balls were being grilled, the beautiful miso aroma was floating in the kitchen and I just couldn't wait to taste them. 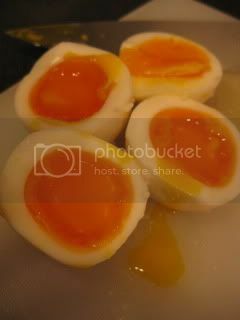 Meanwhile, I sliced my 24-hour shio-koji marinated soft-boiled eggs. Mmm...perfectly done. 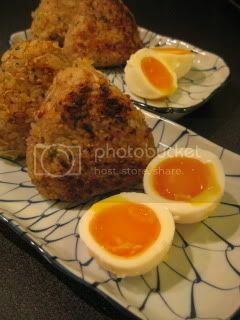 My Toban yaki onigiri with shio-koji marinated eggs. Fantastico...waaaah...sooo good.